Daredevil is the best superhero comic of the last five years. When it comes to quality and consistency, writer Mark Waid and his artistic collaborators have been at the top of the game since the beginning of Waid’s run back in 2011, pulling Matt Murdock from the shadow of decades’ worth of grim and gritty stories to create a fascinating new arc for the character. The first volume explored Matt’s new cheerful outlook on life and continuously tested it with vicious supervillains and the especially difficult obstacle of his best friend’s cancer, but the second volume has moved in a very different direction—out west. After Matt revealed his secret identity as Daredevil while under oath on the witness stand in New York City, he relocated to San Francisco with his legal partner/girlfriend Kirsten McDuffie and best friend Foggy Nelson, who is pretending to be dead to keep out the crosshairs of Daredevil’s foes while he’s in treatment for Ewing’s sarcoma. The change in scenery has done wonders for the already great title, establishing a fresh status quo, introducing new faces to the supporting cast, and giving artist Chris Samnee the opportunity to draw an environment that is a far cry from Matt’s former home base of Hell’s Kitchen. After nearly four years, Waid is still finding new angles on the character, and this week’s Daredevil #14 continues to evolve “the man without fear” by completely removing his mask. 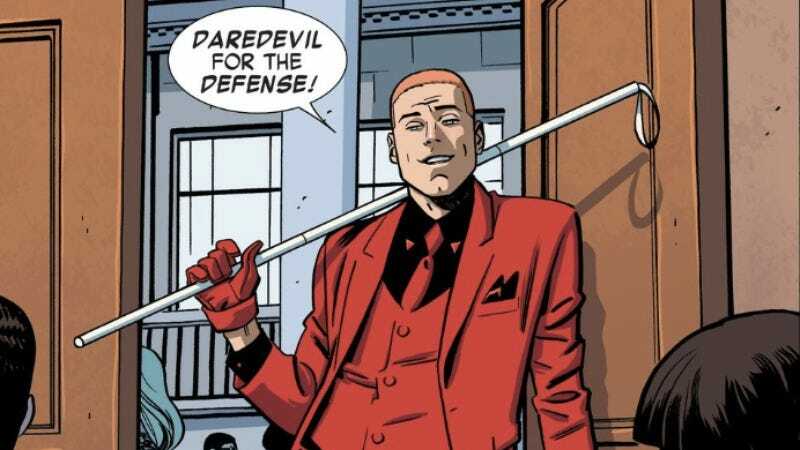 Matt Murdock gets a new costume in this week’s issue, a dapper red and black three-piece suit that reflects his new perspective on Daredevil. There’s no longer a mask obscuring Matt’s face because Daredevil isn’t an alter ego anymore; his identity is public, so what’s the point of hiding? It’s an idea given to him by Kirsten’s father Wendell, the editor of Matt’s upcoming autobiography (ghost-written by Foggy), who asks him why Daredevil still wears a mask. Matt doesn’t have a good answer, and decides that it’s time to lean into his single identity, much to the dismay of the girlfriend caught up in the current whirlwind that is Matt’s life. “What’s the worst that could happen?” Matt asks, but he really should know better than to tempt fate, given his history. Matt’s attitude could easily be interpreted as hubris, which would suggest that this happy new life he’s built for himself is going to come crashing down at any moment. But it can also be interpreted as Matt finally taking control of his destiny and charging forward truly without fear. What’s the worst that could happen? He’s already been through hell multiple times and survived, so why should he be afraid of what the future holds? At this point, Matt could use a reality check to burst his inflated ego, but hopefully Waid doesn’t follow Daredevil tradition and completely upend Matt’s life by the end of his story. Waid’s run on Daredevil has been about transformation, taking all of the elements of Matt Murdock’s past, from his sunny early superhero days to the his bleak later years, and using them to take the character in a bold new direction that is still reverent of his history. Matt’s relocation to San Francisco is a tribute to Gerry Conway’s run in the ’70s, but Waid isn’t rehashing what came before. The location is the same (although present-day San Francisco is a considerably different beast than what it was 40 years ago), but Matt is in a situation he’s never been in before. That’s exciting for both the character and the reader. There’s a renewed sense of discovery as Matt and friends uncover new aspects of San Francisco, and the single identity status quo has opened up intriguing new storytelling avenues. This current volume of Daredevil gained a lot of momentum with the anniversary issue Daredevil #1.50, which offered a look at Matt’s future as he celebrated his 50th birthday in San Francisco. It teased a plethora of new developments, and it’s been a lot of fun seeing Waid introduce them in Matt’s present-day life. One of those teases was the arrival of Jubula Pride, the daughter of Leland “The Owl” Owlsley, who has her first encounter with Daredevil in this week’s issue. Featuring a sleek costume design by Samnee, Jubula is a vicious fighter currently on Daredevil’s side, but that flash forward in #1.50 is a reminder that Matt shouldn’t get used to a new ally. Dramatic irony is a major tool in Waid’s belt, and he creates tension by taking the characters down paths that the reader knows will lead to a bad place. The audience is aware that Matt and Jubula are walking into a supervillain’s base when they arrive at Alcatraz Island, which considerably turns up the suspense as they venture into the abandoned prison. Daredevil is regularly one of the industry’s best-looking titles thanks to the work of Chris Samnee and colorist Matthew Wilson, who recently took over for Javier Rodriguez. This week’s issue #14 highlights the art team’s extraordinary talent. The big development this week is the new costume, which draws attention to Samnee’s impeccable character design. The look is reminiscent of Declan Shalvey’s design for Moon Knight’s “Mr. Knight” persona, but the two suits say very different things. The added touches on Matt’s suit—the black pocket square, the red tips on his collar, the “DD” belt buckle—bring a showy flair to his ensemble that isn’t found in Shalvey’s streamlined, all-white design, and the lack of a mask softens Matt considerably. It’s not the most convenient outfit for an acrobatic superhero, but it definitely makes an impression. Also, this is a superhero comic, and someone fighting crime in a three-piece suit doesn’t require all that much suspension of disbelief. For the opening scene leading up to the costume reveal, Wilson limits his use of the color red to Matt and the stripes on the American flag. It’s a simple way of ensuring that the reveal lands with maximum impact, but the coloring also builds anticipation. As Matt rushes to trial, there’s a shot of people’s legs going up and down the courthouse steps, a cluster of gray, blue, and black slacks interrupted by two bright red boots. Something is clearly different about this day in court, but the art merely suggests that Matt is showing up in his classic Daredevil duds, not in a brand-new flamboyant red suit. The coloring is essential to the misdirection before the reveal, but also provides the extra punch when Matt shows off his new look for the first time. Samnee’s skill for panel composition is showcased in the conversation between Matt, Kirsten, and Wendell in AT&T Park, which begins with a 20-panel two-page spread that is a master class in making a scene of talking heads energetic and visually captivating. Batting practice is occurring at the same time as the trio’s discussion of Matt’s identity issues, and shots of the baseball action are sprinkled throughout the dialogue as Wendell and Matt hit the plate. After reading this spread, it’s worth taking the time to look over it again focusing only on the art to see how Samnee takes advantage of the high number of panels to flesh out the environment and give his character’s more complex blocking. These are just a few examples of the artistic excellence that Samnee and Wilson bring to this title every month, and the only bad thing about their work on this issue is that it brings them one step closer to the conclusion of their run. This creative team is departing the series at some point this year, and the future of Matt Murdock is uncertain given the unknown state of the Marvel Universe following Secret Wars. With the character making his Marvel Cinematic Universe debut in next month’s Daredevil Netflix series, it’s very likely that his comic will return to the grim and gritty style that the TV show is embracing. But hopefully Marvel won’t undo all the work done over the last four years. Waid and his collaborators have labored tirelessly to make Daredevil a remarkable superhero comic month in and month out. Rather than stepping back to a more familiar version of the character, Marvel should keep moving forward and continue exploring the fearless new life Matt has created for himself.